I've had my "low end" 10 GB first generation iPod for a few months now, and I think it's great. I use it, along with File Synchronization from Némésys Software, to keep all of my important work files synched between two eMacs (one in the house, one in the apartment) and my PowerBook G4/400. I also use it to synchronize my iTunes collection among the three Macs, something that requires third-party software (since iTunes won't do it). And I use iSync to synchronize Safari bookmarks, my iCal calendars, and my Address Book - in addition to doing that with my .mac account. The one thing I've rarely done is listen to music on my iPod. I've never been a fan of headphones. I don't like the wires that catch on so many things. And I generally prefer to work in silence. Because of that, the iPod has been used primarily as a small, light hard drive. Until now. The one place I listen to music is in the car. I have my country station (B-93) on the first button and one of my two favorite mix CDs in the CD slot. When I get tired of the ads or hearing the same song for the third time, I hit the CD button. When I go through that, it's back to radio. My 1999 Pontiac Montana didn't have a cassette deck, and neither does the 2002 Taurus that replaced it. There's no line input on the stereo either, and I wasn't ready to spend US$40 for an iTrip. From everything I'd read, cheap FM transmitters were, well, cheap, and the good ones were expensive. 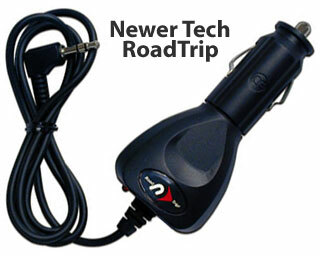 Then I ran across a review of the Newer Technology RoadTrip 87.9 FM Transmitter on iPodlounge. Jeremy Horwitz said it sounded better than the other leading FM transmitters - and it sells for just US$15! This sounded like the perfect accessory for my iPod, since there was no way to physically connect it to the car stereo. I followed the link to Other World Computing's online store, found a demo unit at an even lower price, and placed my order. The next day my RoadTrip 87.9 FM showed up. Let me start by saying that the RoadTrip is nothing to look at. It looks an awful lot like one of those power adapters you might use to connect your Discman or Walkman to your vehicle's cigarette lighter. There's nothing impressive about the way it looks. The way it works, however, is impressive. You plug one end into the lighter and the other end into a headphone jack. Any 1/8" headphone jack - iPod, Walkman, Discman, you name it. This is not an iPod-specific device. No software to load. No frequencies to set. * No need for a dock connector. It's brilliant in its simplicity. Turn on your music player, tune your radio to 87.9 FM, and you're ready to listen. To get comparable volume to my radio, I end up with the iPod set between 80% and maximum volume, and it sounds good. Now I can pick a playlist, set the iPod in a cup holder, and listen to my favorite music commercial free. Instead of sitting next to my Mac of the day, my iPod goes with me now for anything but the shortest trip. And now I've really got incentive to rip the rest of my CD collection in iTunes. As Adam Robert Guha notes in an article we'll be posting on Friday, the iPod really does change the way we listen to music. No more linear tapes or LPs. No more limited number of tracks on a favorite mix CD. Instead, hundreds or thousands of songs with as many mixes (playlists) as you care to create. Being able to connect your iPod to your car stereo is a great step forward, and at US$15, the simplicity and sound quality of the RoadTrip 87.9 FM make it a steal. * There are only three licensed US radio stations at 87.9 FM, so unless you're near La Canada (CA), Sun Valley (NV), Brazos (TX), or a pirate radio station, there's no need to worry about interference. Unlicensed short-range FM transmitters are illegal in some jurisdictions, including the UK.